Are you like me and absolutely love beads? I am just getting into lampwork beads and I have to admit that the skill of some of the people that create these beads simply blows me away. 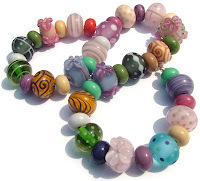 Laura Sparling is one such that I am in total awe of and she is running a wonderful contest on her blog for the beads shown above. Be sure to head over and enter for yourself. Thank you for the wonderful mention!